Wilco are bringing back their Solid Sound music and arts festival this summer, and the lineup has just been revealed. 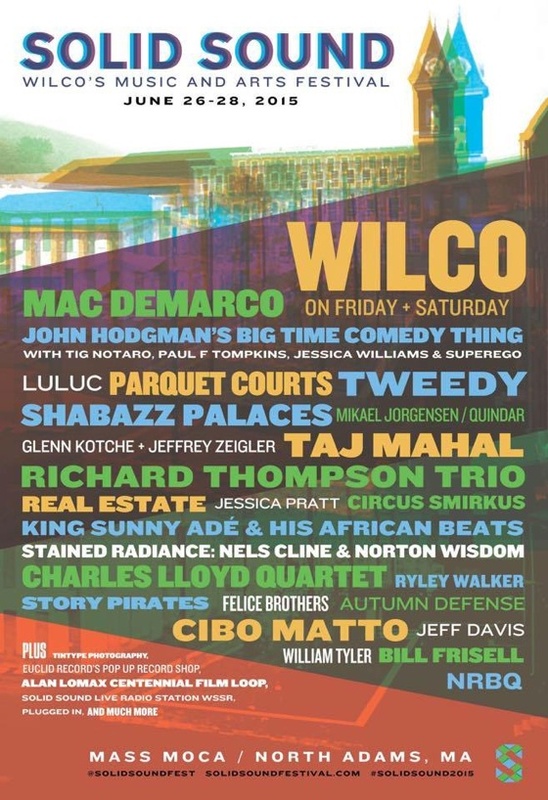 In addition to Wilco's headlining set, Tweedy, Real Estate, Mac DeMarco, Parquet Courts, Shabazz Palaces and Jessica Pratt will perform. Rounding out the bill are Cibo Matto, William Tyler, Richard Thomson, NRBQ, King Sunny Ade, the Autumn Defense, Ryley Walker, Stained Radiance (Nels Cline + Norton Wisdom), Glenn Kotche and Jeffrey Ziegler. Comedy sets from Tig Notaro, Paul F. Tomkins, John Hodgman and Jessica Williams are also on the schedule. Solid Sound Fesival will take place at MASS MoCA in North Adams, Massachusetts, from June 26 to 28. Full festival details can be found here.